Los Molinos 25 is a luxury villa, beautifully situated in La Manga Club, with gardens, terraces, super views over La Manga Club to the Mar Menor and a few minutes walk to the lovely pool and bar/restaurant through the olives. Close by is Bellaluz Square with shops and restaurants, the 28 court Tennis centre, Par 47 golf, shops, services, chemists and children's club. The three international golf courses are within easy reach. Discounted golf and tennis is available to Residents as our guests. Golf, Tennis and Bowls facilities: La Manga boasts three golf courses and an 18 hole Par 47 pitch and putt course to cater for all abilities. A number of championships are held at La Manga throughout the year. The ranges are extensive and there is a high quality Golf Academy for those in need of tuning up. The Tennis Centre has a large number of courts including artificial grass, clay and hard surfaces. There is also Squash available. Resident professionals can provide any needed tuition. Residents golf and Tennis discounts are available. There is a good six lane bowls green. For those with children, there is a well supervised creche. Holiday was excellent. Your villa is very well equipped with all the comforts of home. The location is also very good being close to the pool but still enjoying a quiet site not overlooked by others. I notice that La Manga has not forgotten how to charge handsomely for just about everything!!! Nonetheless a great time was had by all. We tend to be beach as opposed to pool people and there was a good choice all within a short drive. Restaurants on and off site were also very good with something for everyone. Ultimately feeling the sun on my back and seeing a blue sky was enough to make my holiday. Glad we chose your villa. Would we go back? Absolutely. Just a quick email to say thank you so much for the rental of your villa. We had an amazing time, just perfect! The weather was fab and everyone was so nice to little Charlie - I think it helped being not high season - we had the baby pool to ourselves most days! We loved every minute of it and the location of your villa and Los Molinos itself is the best out of all the villages I have stayed in previously. We think your home is truly lovely, perfectly positioned for all sorts of reasons and a real home from home. It is so lovely to rent a home where the kitchen is fully kitted out with everything needed, sadly lacking in most rental properties. We are having a very relaxing time and our little girl is enjoying the afternoons at the childrens club. We have been watering your plants as it has beenvery hot and dry although I understand some rain is coming at the end of the week. We are back in Germany. Over 35 years we spend holidays in Spain. The last 10 years we lived in villas in Valencia, Almeria, Sevilla. But your villa was the best. Congratulation. The country, the resort, the resort management, the weather, all perfect. For holiday in 2013 I will sent you a mail in December. Thanks very much for allowing us to stay on a bit later on Friday. It made a big difference given our later flight time. As promised here is a short testimonial. Thank you so much for a really great stay in Los Molinos. We had a really enjoyable time. The house is so well appointed and equipped: it was everything we could want. We just returned after 4 wonderfull La Manga days. And we enjoyed your house so much. Very well equipped kitchen (the first thing I always look for when I arrive at a ret-house is… sharp knives; if that’s okay everything almost always is – and yours were perfect), nice quiet location and yesterday evening, Jan and I sat on the upper sun terrace until 1 o’clock enjoying the view, the starry night the bats and everything. I’m glad the money finally got to you. Thank you again; we hope to come back to your house again someday. Both tiled bathrooms are very roomy, fresh, attractively equipped with modern furnishings and well appointed. They are well lit with downlighters and have large wall mirrors. The showers operate with good water flow and have a plentiful supply of hot water. There are heaters for the cooler months and a dehumidifier to keep the rooms fresh. The air conditioning has an inverter to provide heat in cooler months. 30m away from the front door on the roadside. Can be obtained by credit card from locally provided wifi transmission to the villa. Can be paid for by credit card locally. There are 4 chairs in the dining area with others elsewhere and a high chair can be hired from the agent. La Manga Club has extensive tennis and coaching facilities. La Manga Club has 2 fully professional courses and a very good country course to the west. Clean and well presented property. Lovely setting and views. Well equipped and helpful advice from Marc the owner. We stayed in August for 11 nights. The villa was comfortable and the views where amazing from the roof terrace. The bedrooms and bathrooms where a bit damp. We noticed other properties being updated and think maybe it’s time for this property to be updated. Although this would probably impact on the cost of renting. Marc the owner was fabulous. He gave us lots of information and was very helpful. Thank you Marc. Beautiful villa with glorious views. Incredibly well equipped and appointed. This villa is stunning! 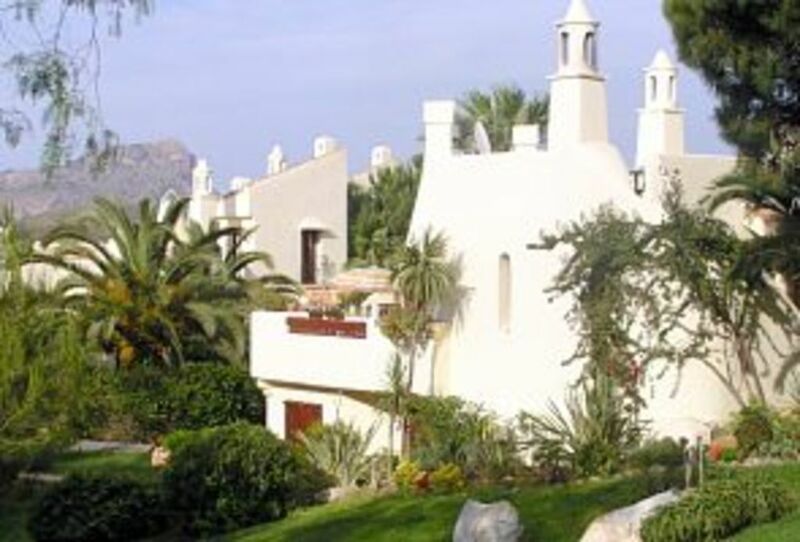 I’ve been going to the La Manga Club for more than 30 years and this is the best equipped accommodation I’ve ever stayed at - including family property I have used. Inside and outside everything is comfortable, well organised and immaculately clean. The management company are very helpful and dealing with Marc was a joy. The process was simple and he was very accommodating with a late check out. We know the area well but Marc provided lots of useful information both in the villa and before we left. The pads for the sunloungers was a lovely addition and meant we spent more time using the solarium than we have ever done before as there’s a great breeze. The fridge contained wine, beer and water - bee welcome after our late arrival! The cupboards are stocked with basics which we topped up or replaced as an ‘honesty box’. The whole experience was delightful and I would recommend this property without reservation. We stayed here for 5 nights. A beautiful villa which was clean and well maintained. The beds were comfortable and bathrooms had good powerful showers with plenty of hot water. Well equipped kitchen. Easy reach of Los Molinos pool and 5 mins walk to Bellaluz square. Los Molinos in La Manga Club, Murcia is delightfully situated on a wooded peninsular, backed by hills with the Mar Menor 2 miles to the North and the Mediterranean just over the hill to the South. There is a sandy cove on the Mediterranean, La Cala, nearby. It is within the La Manga Club Resort which has a host of sporting and leisure facilties including 3 international golf courses, a Par 47 practice course plus a superbly equipped range and academy. The tennis facilities are second to none with an academy and 28 courts of all types. There is a very well appointed Spa. Located in Murcia 20 minutes drive from the airport, it is close to Los Belones and near to the old Roman/Carthaginian city of Cartagena and its many attractions. It is a mainly farming with small fishing villages such as Cabo de Palos, which has a marina with restaurants and a great Sunday Market with every sort of food and goods. There is an extensive coastal nature reserve, Calblanque, with great beaches close by. Golf: La Manga Club has three golf courses and a good par 47 pitch and putt practise course. There are excellent practise grounds with driving range, putting greens, pitching areas and bunkers. The Golf Academy provides coaching for all levels of play in excellent surroundings. The main championship courses, North and South, have been completely refurbished recently. The addition of more water features and improved greens makes for interesting and challenging play. Guests of owners are provided with a letter enabling much discounted green fees from the walk in price. The West course is quite unique. Based around a hillside a few minutes from La Manga Club, it requires patience and some skill to negotiate the many unusual holes. However, the fine countryside compensates. There are two clubhouses, which provide a range of food and drinks and in the main Clubhouse, there is a well appointed shop. Tee off times can be booked on the La Manga Club web site before travelling, which is advisable as the courses can get busy, even in the Winter. Note that only rubber spikes are allowed but these can be fitted in the main Clubhouse for a modest fee. In addition to the buggies, which must use the fairway side tracks, there are three wheel buggies for single use that can use the fairways. Electric trolleys are available for hire. We provide storage in the villa for golf clubs and hand trolleys. Changeover days are normally Saturdays but others are possible. The nightly rate applies for 4 nights and then reduced by 50% for the fifth and 6th nights unless otherwise stated. We ask for a non-returnable 25% deposit with booking and the balance 6 weeks before occupancy. A brochure, maps, receipts for payments, discount letters for residents' rates for golf and tennis and further information are provided including key collection instructions. The weekly rental includes, heating and air conditioning, electricity, weekly cleaning and linen change (not beach towels) and the use of a stair gate. An arrival food pack, high chair, cot or child's bed is available from the local management company at an additional charge. Payments can be made in Sterling or Euros on-line. The charges are fully inclusive except for any extra charges ordered on the booking form.